The much-anticipated alliance announcement by Volkswagen AG and Ford Motor Co. left investors feeling let down as it lacked a big-bucks plan to join forces on electric vehicles and self-driving cars. Wall Street was hoping for a blockbuster deal, such as the billions of dollars General Motors Co. landed for its self-driving unit from Honda and SoftBank Vision Fund last year. There also was some belief Ford would tap into VW’s massive electric-vehicle development program, so the companies could jointly take on Tesla Inc.’s dominance of that segment. Instead, VW and Ford merely said they’re committed to exploring those areas, and formalized cooperation on commercial vehicles -- a project the two companies announced they’d pursue seven months ago. The payoff from joining forces to develop trucks and vans won’t be peanuts: Ford sees the tie-up adding $500 million to its annual pretax profit. But that benefit won’t be felt until 2023. 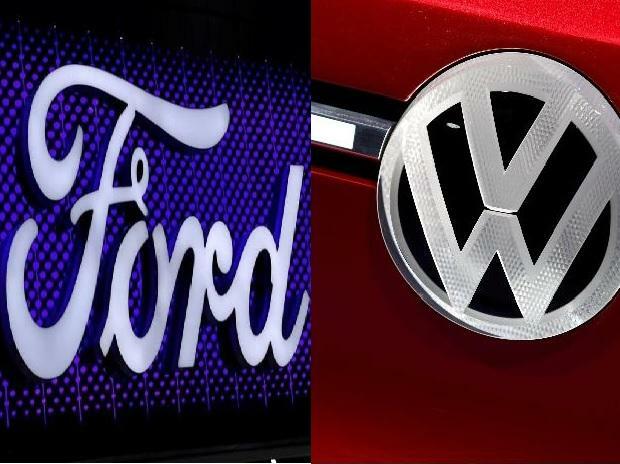 Volkswagen shares closed up just 0.3 percent Tuesday, while Ford fell 1.7 percent. Both entered the year looking for a lift after their stocks dropped about 17 percent and 39 percent last year, respectively. The commercial-vehicle alliance may do more for VW than Ford, as it fills two weaknesses in the German automaker’s commercial lineup -- pickups and delivery vans -- that are already areas of strength for Ford, Jefferies analyst Philippe Houchois wrote to investors. The market continues to wait for more from Ford on how it’s going to improve its fortunes. “Ford keeps frustrating investors by delivering piecemeal information on its future plans,” Houchois said in a note. He recommends buying the shares and has an $11 price target. Chief Executive Officer Jim Hackett has been disappointed right alongside Ford investors. On the floor of this week’s North American International Auto Show in Detroit, Hackett told Bloomberg Television he’s not happy about how Ford performed in 2018. Wall Street would like to see a more detailed plan from Ford on its path forward, said David Kudla, the chief executive officer of Mainstay Capital Management in Grand Blanc, Michigan. Whereas GM’s CEO Mary Barra has been articulating a clear vision and comprehensive strategy, “we haven’t seen that from Jim Hackett,” he said. Ford Executive Chairman Bill Ford elevated Hackett, 63, to CEO in May 2017 and gave him a mandate to speed up decision-making. In his own Bloomberg TV interview, the great-grandson of founder Henry Ford estimated the company is in the third or fourth inning of transforming itself for the demise of the internal combustion engine or the driver at the wheel. “The problem is, there’s never a ninth inning because this business keeps reinventing itself,” Bill Ford said Monday. Charting that future has been challenging as automakers attempt to control their own destiny while seeking to share the burden of tens of billions in costs required to develop self-driving cars and electric vehicles. VW has committed $50 billion to its electric vehicle program, while Ford is investing a combined $15 billion on battery-powered cars and driverless cars. Volkswagen CEO Herbert Diess told reporters Monday that his company is committed to owning the software stack that controls self-driving cars, and that joining forces with Ford in that regard hasn’t been decided.